One of my favourite bloggers, Servetus, asked after my last post if koalas really are as cute as they look. And yes, they really are. At least as cute as puppies, certainly as cute as kittens. Watch this koala joey’s first photo shoot for a cuteness overload! Sadly, they’re a lot more vulnerable than those domestic pets, despite their cute factor and their popularity as Australia’s national symbol. They’re wild animals, generally nocturnal, very curious and often surprisingly trusting of humans. It used to be very rare to see a koala in a suburban environment, but increasingly as their habitat is destroyed by urban encroachment, we’re seeing them during the daytime seeking help – usually needing water. Here a young male has wandered into a suburban backyard and gets a drink from a kind stranger. It’s not only urbanisation that’s threatening them. Along with many native Australian animals, they suffer severely during our summer bushfire seasons. Photos from this video were seen around the world after Australia’s 2009 bushfires. Again, a koala is desperately needing water, and puts up with being petted for the sake of a drink. Domestic dogs are a threat. Cars are a threat. Backyard swimming pools are a threat (in my suburb, homeowners with swimming pools are installing ropes just under the lips of their pools, so koalas who fall in after seeking a drink have a way of climbing out again). 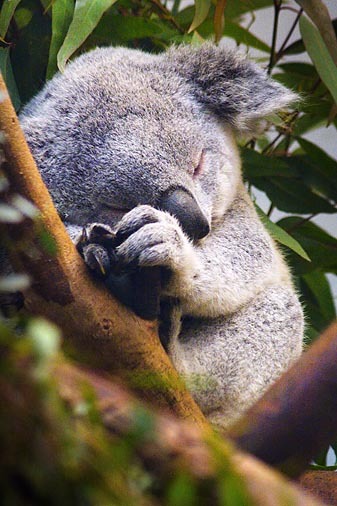 Chlamydia is ravaging many koala populations, causing blindness and infertility. In rural areas, cattle are a threat. Young male koalas, particularly, are attacked by cows which herd and trample them as they attempt to move between trees. 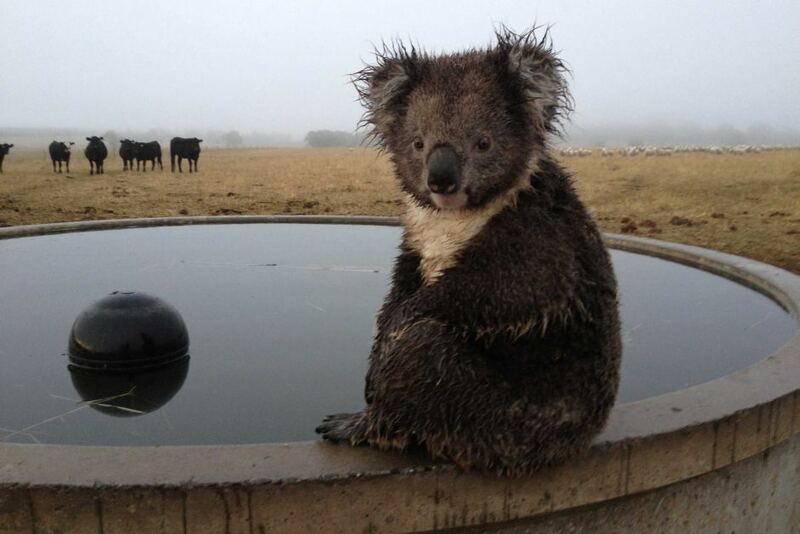 This photo went viral in Australia under the heading “Koala takes a bath”, until it was pointed out the koala was probably trapped between the water trough and the cows behind it. Unlike roos, they’re fairly slow moving and can’t get themselves out of trouble in a hurry, particularly on open ground. Sorry, this is all very grim! The question was their cuteness, but it’s hard to talk about how beautiful they are without despairing over how endangered they are. Back to the cute! Their fur is just as soft as it looks, even on full-grown adults. They have very sharp claws, and have been known to climb human “t rees” standing too still watching them. And they’re often not terribly nice to each other, either. This pair fought like children over a favourite tree. The crying you hear in the video isn’t how we usually know koalas are about. More often, they sound like this (and usually in the depths of the night!). Their feeding habits also appear to be changing. It used to be believed they only ate leaves from a very limited range of eucalypt species, but researchers are now discovering they’re also eating insects as well as from a much wider variety of tree species – whether this is an adaptation to their changing environment or simply a new discovery of longstanding behaviour, we’re not really sure. Their smell is unmistakeable, thanks to their eucalyptus diet, but unlike possums, it’s not particularly unpleasant. In fact, there’s nothing nicer, really, than bushwalking through a eucalyptus forest and sniffing that koala aroma on the breeze! So yes, they are absolutely as cute as they look. Come on down and visit, Servetus, and I’ll introduce you! Thanks for the answer! I’m relieved to hear they don’t smell bad (you are not wrong about possums). I can imagine the claws are wicked. Found this through Serv – what an interesting read. Thanks for the insights. Great post! Wonderfully detailed. They certainly don’t sound as cute as they look! I’m more of a wombat fan myself 🙂 Near the Great Ocean Road in Victoria there is a population of Koalas eating themselves out of house and home. The trees are stripped bare of leaves and there was a great controversy over a culling of the population that occurred on the quiet so they didn’t all starve. Unfortunately cases like this of “over population” confuses the message about Koalas being a threatened species which, as you rightly explain, they absolutely are. Lovely blog Gracie. Koalas are in trouble for the same reasons you outline. down our way as well unfortunately. I agree about tempting Servitus to visit here one day, BTW. I’m actually trying to get dad there (Australia / NZ was on his and mom’s bucket list and I don’t want him to miss it just because she can no longer go with him). Him going there may need to involve me going.